Acquiring eternal success is much like attaining passage into a beautiful kingdom, a kingdom made accessible only by passing through a mighty door. The door, being the only entrance into the kingdom, is secured firmly. In order to open the door, one must obtain keys to unlock it. 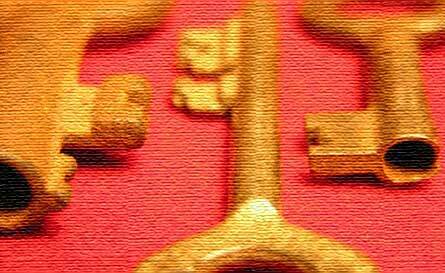 Because the kingdom is ruled by a very gracious king, the keys are accessible to all who request them from him. Just as one must accept the keys to open the mighty door to the “beautiful kingdom,” one must do the same to acquire eternal success! The Lord provides five important keys that open the door to understanding His success. The first key to eternal success identifies the problem that keeps us from attaining it. The Bible says, “For all have sinned and fall short of the glory of God” (Romans 3:23). Notice it says, “all”. The word “all” denotes everyone without exception. As a result, everyone without exception falls short of God’s glory. In other words, all men fall short of matching and maintaining God’s perfect standard of holiness. It is His standard that all are judged by! Some might wonder, “Is it fair that we are judged by such a high standard?” Think for a moment, is it fair that those who want to become members of the Olympic Team be judged by the standards of the best athletes in our country? Of course it’s fair! Why? Because only those who meet the high standards of an Olympic athlete are allowed to take part. If we, as mere men, can set very high standards for those things we deem important, why can’t God? The Kingdom of God is far more special than the Olympics. Thus, to enter His kingdom, we must meet the highest standards, the standard of perfection! Heaven is God’s dwelling place, and because of His holy nature, only those who meet His standards are able to enter based on merit. The problem is, man is incapable of attaining God’s standards. All fall short of God’s standard of perfection! Recognition and acceptance of our sin problem is absolutely necessary to take the first step toward eternal success. Have you acknowledged before God that you are a sinner? The second key identifies the Punishment resulting from our failure to meet God’s standard for success. The Bible says, “For the wages of sin is death” (Romans 6:23). Each of us fall short of God’s glorious standard because we sin. Sin is disobedience to God. The result of our misconduct is punishment. Every time we sin, we “earn” the wage of a sinner. The wage of a sinner is spiritual death and eternal separation from God. The wages of sin likens us to spiritual debtors. Because we are unable to pay our debts, we must be punished. The Bible says the place of punishment is called the Lake of Fire. This is a place of continual suffering for all eternity. Man is sent there, not because God has wronged man, but because man has wronged God! Is such a strong punishment fair? Most certainly! Sin is an abomination to God. It is an affront to His holiness! When men are confronted with sins “against humanity”, such as the Holocaust, most agree the offenders deserve the severest punishment possible for their crime. If mere men believe severe punishment is necessary for abominable acts of injustice, why can’t God expect the same? As the most moral and just Being, God is more than capable of accurately determining and fairly acting upon man’s sin. And He has concluded that because of our sin, each of us rightly deserve physical and spiritual death. Have you come to the place in your life that you believe you deserve to be punished for your sin? The third key identifies the Provision that enables us to overcome sin and punishment, thereby granting eternal success. For centuries man longed to fly. Try as he might, he could not. Until the airplane was invented, flight was impossible! The airplane provided man with the ability to fly. Similarly, many have longed to enter the heavenly realm, but try as they may, apart from God’s transport, heaven too is unattainable. Thus, roughly two thousand years ago, God in His graciousness, sent His Son Jesus Christ to the cross. He did so because all sin must be punished. Therefore, He allowed His Son to bear man’s punishment that the free gift of eternal life could be extended to all. The Bible says, “But God demonstrates his own love for us in this: While we were still sinners, Christ died for us” (Romans 5:8). Scripture also says, “For by grace you have been saved, through faith–and this is not from yourselves, it is the gift of God” (Ephesians 2:8). The Lord did for us what we could not do for ourselves. The perfect God-Man paid the ultimate price for our sins by shedding His blood on the cross. Thus, He offered His life on our behalf. As a result, through Christ–our provision, the Kingdom of God and eternal success are now attainable! The fourth key identifies the Promise God made with man. There is nothing mystical about claiming God’s promise. Rather, Scripture says, “For God so loved the world that he gave his one and only Son, that whoever believes in him shall not perish but have eternal life” (John 3:16). The basis of God’s promise centers around truly believing that Christ died to pay for our sins, and in turn, overcame death through His bodily resurrection. — Recognizing your sinfulness, and confessing it to God. — Asking His forgiveness and cleansing from your sin, based on Christ’s shed blood and ultimate death on the cross, and truly believing Jesus died to pay the penalty for your sins. — Embracing Christ’s resurrection from the dead, thus defeating death and sin on our behalf. — Turning from sin’s rule over your life, to Christ’s loving oversight. True salvation is a free gift of God; it cannot be earned! Yet to truly be saved, we must embrace by faith that which Christ did for us, and turn from sin to follow Him, thus making Jesus and our new life in Him our number one priority! If you want to claim eternal life and grasp true success, in the quietness of your heart talk to the Lord about it. Let Him know you realize that you have a sin problem and you now understand you deserve punishment because of it. And based on all that Jesus did on your behalf, ask His forgiveness and cleansing from your sins. Let the Lord know that you are now giving your life over to Him and letting Him take control, for you have come to realize that apart from Him, eternal life and true success are impossible. Go to the Lord in prayer and claim His free gift of salvation. Don’t wait—do it now! The last key we must grasp is the Purpose of eternal success. The Lord did not send His Son simply for us to claim success, but more so to live successfully! There are three basic elements to living a successful life in Christ. The first element is sharing Christ with others. The Bible says, confess with your mouth the Lord Jesus” (Romans 10:9 NKJ). By sharing Christ with others, we proclaim our allegiance to Him and Him to us. We also afford others the opportunity to come to know Him as well. The second element is becoming like Christ in all areas of our life. Scripture says, “Everyone who has this hope in him purifies himself, just as he is pure” (1 John 3:3). The validity of our success in Christ is witnessed through a change in our heart’s motivation and outward actions. Through obedience and submission to God and His Word, the Bible, we prove the sincerity of our claim to be His followers. The last and most important element is glorifying God. The essence of true success is found in seeking always to glorify God through our lives. Jesus said, that by our good works others will see and in turn they will “glorify your Father in heaven” (Matthew 5:16 NKJ). Scripture adds “whether you eat or drink or whatever you do, do it all for the glory of God” (1 Corinthians 10:31). Man’s first and most important priority in life is to exalt God in all things. The Lord has proven Himself to be a gracious and loving God. Countless times each of us have sought our own good, while ignoring His. Rather than exalting Him, most spend their lives exalting themselves. Instead of seeking to further His interests, we get caught up in our own. Clearly, God has no reason to freely grant us eternal success–yet, graciously He does! With so much freely given, let us begin to freely take! The Lord longs for a relationship with you. He has done everything possible to create one. Now we must respond by embracing Him as our Lord and Savior!